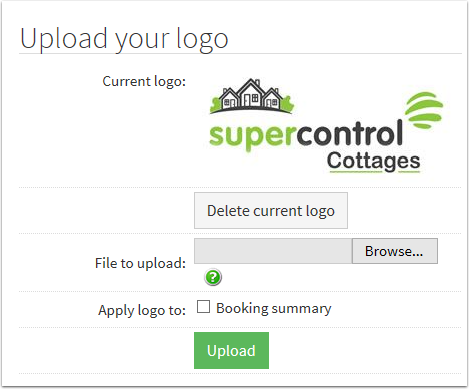 Help CentreUsing SuperControl Setting upHow do I upload my company logo? 1. To upload your logo, go to Admin > Logo Upload. This is where you should upload and save your company logo. 2. Click Browse to upload a file to SuperControl. Please note the size of the logo should not exceed 1MB. 3. It is possible to Rotate and Resize an image (increase or decrease the percentage). To resize an image, choose the percentage increase or decrease, then click "Apply". You can also crop the image, and adjust the height and width. Click "Crop", then "Accept" when done. For PLUS/AGENCY users: you can tag your logo within your email templates so the logo pulls through by default at the top of your template. For LITE users: if you’re using our standard booking template pages, your logo will display the top of the website when a guest is proceeding through the booking process. Prev: How do I add a third party agent? Next: How do I add customer ratings?